Corporal George J. Oelkers of the 390th Bomb Group, examines a German butterfly bomb, dropped on Parham. Originally passed for publication 23 Aug 1943, but then revoked from publication same day. Printed caption on reverse: 'U.S. Bomber Station Raided Last Night. Associated Press Photo Shows:- Cpl. 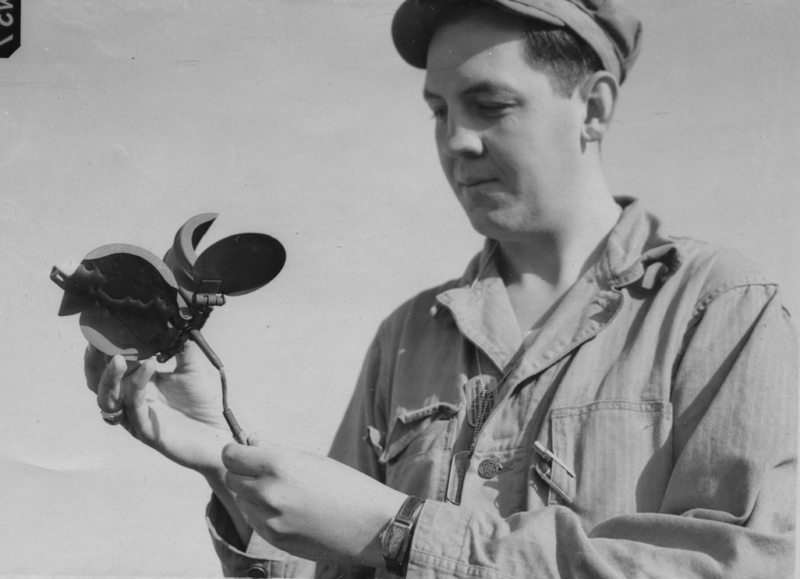 George J. Oelkers, of Maple Wood, N.J., holding up the outer casing of one of the butterfly bombs. WOR 259912. 23-8-43-Y.' On reverse: Associated Press, US Army Press Censor ETO, US Army General Section Press & Censorship Bureau and Ministry of Information [Stamps]. Corporal George J. Oelkdersof the 100th Bomb Group, examines a German butterfly bomb. dropped on Thorpe Abbotts. Originally passed for publication 23 Aug 1943, but then revoked from publication same day. Printed caption on reverse: 'U.S. Bomber Station Raided Last Night. Associated Press Photo Shows:- Cpl. George J. Oelkers, of Maple Wood, N.J., holding up the outer casing of one of the butterfly bombs. WOR 259912. 23-8-43-Y.' On reverse: Associated Press, US Army Press Censor ETO, US Army General Section Press & Censorship Bureau and Ministry of Information [Stamps]. Corrected caption from roster listing in the 390th Bomb Group unit history.